All songs by Donovan P. Leitch, except: 04 by Bert Jansch, 05 by Paul Bernath, 07 traditional arranged by Donovan and 11 by Shawn Phillips. All bonus tracks by Donovan P. Leitch, except: Universal Soldier by Buffy Sainte-Maire, The War Drags On by Mick Softley, Do You Hear Me Now by Bert Jansch. · Shawn Phillips: twelve-string guitar on tracks 06 and 08. · Terry Kennedy: arrangement on track 03. · The cover picture was taken by Jack Pia. · The cover includes part of the lyrics to Sunny Goodge Street. · On the back cover, before the track list, there's a subtitle that reads Songs For Sunshine People. · In the musicians list appears Shawn Phillips playing twelve-string guitar in a song called Song With Your Name, which doesn't exist. Probably an out-take. · The album version of Colours is the same recording that appeared on the single, but the part where Donovan plays the mouth harp on the bridge was edited. · In the USA, Hickory replaced the version of Bert Jansch's Oh Deed I Do with the version of Buffy Sainte-Marie's Universal Soldier, probably because it was released as a single in the US the previous September, with great success. · Donovan "stole" The Little Tin Soldier from his friend Shawn Phillips. 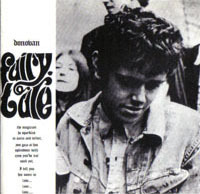 When he first heard the song about a toy soldier with only one leg who was in love with a tiny ballerina, he identified with the lyrics (Donovan had a slight limp after he suffered polio in his childhood and the ballerina was Linda Lawrence, his great love). · Turquoise was dedicated to his friend Joan Baez. In a 1965 interview with Brian Matthew, in the BBC, Donovan is asked the reason of the name "Turquoise". He giggles and answers: "I don't know, it's a nice name". He looks shy about telling the meaning of the song, but on later interviews he has declared that he was in love with Joan Baez and that the song was written for her. Joan Baez recorded a version of the song in her 1967 album Joan. A few years ago, a juke-box which belonged to John Lennon in the 1960's was discovered. It contained a tracklist of 40 singles, written in Lennon's own handwriting, that marked his musical inspiration at the time. Number 2 on that list was Turquoise. John Lennon mispelled Donovan's name and wrote: "Turquoise Donavon". Source: YouTube video. · In a recent interview in February 2009, Donovan has declared that he took Hey Gyp (Dig The Slowness) from someone else, but he didn't know his name, so he couldn't send him the rights to the song. Donovan arranged it and gave it this title. This song has always been credited to Donovan. Probably it was based on a song called Can I Do It For You and Donovan retitled it in reference to his friend Gypsy Dave. · Most of the later reissues add "the" in some titles, like The Summer Day Reflection Song, The Ballad Of A Crystal Man and The Ballad Of Geraldine. It isn't clear which one of these titles is the correct: even in the original release of Fairytale, the back cover lists these songs without "the" but the record label lists them with "the". We've chosen to list the songs without "the", except for The Little Tin Soldier which is listed in some reissues as Little Tin Soldier. Also, some of the later reissues list To Try For The Sun as I'll Try For The Sun. Even the original release lists To Try For The Sun on the back cover and I'll Try For The Sun on the record label. We think the first one is more correct. · Some of the later reissues include the EP version of Ballad Of A Crystal Man that appeared in The Universal Soldier EP, on August 15, 1965, before the release of Fairytale. A lot of them list this version as The Ballad Of A Crystal Man. Some of them list the song as The Ballad Of A Crystal Man (edit), although it's not an edit but a totally different recording.